← Archangel Season Finale 11/23/2013 Massacre! Cut all of the red meat out of the fish, I mean all of it, this is the part that tastes fishy. Bring a pot of salted water to a rolling boil, then boil the striped bass for about 8 minutes, and immediately transfer the fillets into an ice water bath to stop them from cooking. This will keep the fish from overcooking once you are finished boiling it, and helps it maintain a firm consistency. Hold the fillets in the ice water bath for approx. 10 minutes. While the striper is chilling, finely mince the green pepper, onion, garlic and basil. Combine the vegetables and garlic with the rest of the ingredients, except the fish, in a large mixing bowl. Once the striper is finished chilling, cut it into small pieces (imagine pieces of crab in a crab cake, around the size of a cigarette filter), not giant chunks. 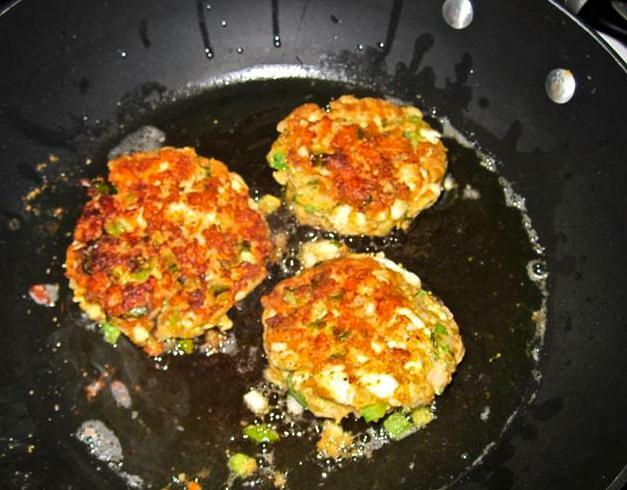 Make small hamburger sized patties out of the mixture, sprinkle them lightly with Old Bay, and then pan fry them in olive oil on medium high heat approx. 4 minutes per side or until nice and dark brown (don’t burn them!). When they are finished squeeze a little bit of fresh lemon over the top of them and serve them. You can also take extra uncooked patties and give them away or wrap them in wax paper then in a Ziploc freezer bag.